If you have an event you wish to submit as a satellite please contact events (@) alia.org.au. Calling all LARKs attending the ALIA Information Online Conference, come along to the meet-up (Thu 14 Feb, 12:15 – 1:30). 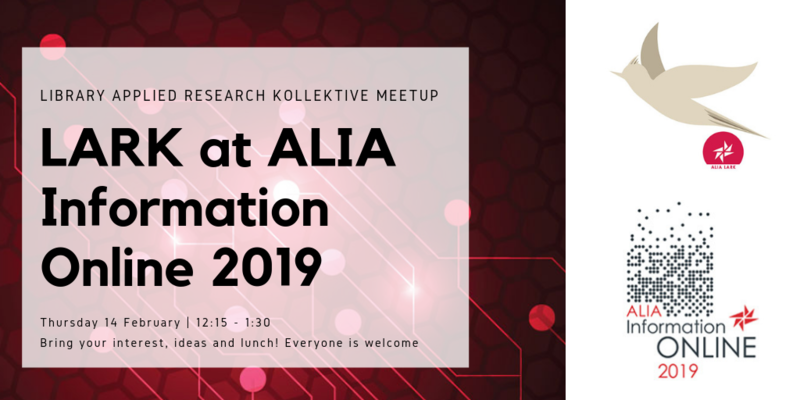 Bring your lunch and meet members new and old and get involved while we discuss what 2019 has in store for The Library Applied Research Kollektive (LARK). Do I bring anything? Interest, ideas and your lunch! Come along to this informal catch up to share your ideas of what you’d like to see and contribute, and become part of the group. LARK (Library Applied Research Kollektive) fosters evidence-based practice and applied research in library and information studies. We have close connections with other professional groups interested in how people learn and work with information. LARK is a thriving ALIA group with a mailing list, Facebook presence, and face-to-face and online events. Our collaborative blog has visitors from all over the world. CEIRC (CAUL Electronic Information Resources Consortium) is holding its annual Datasets Coordinators' Meeting and Forum in Sydney on Monday 11 February 2019 from 9.00am to 5.00pm. Please note this meeting is for CAUL/CEIRC members only. Please visit https://www.caul.edu.au/events/datasets-coordinators-meeting-2019 for more information. Join us at Arup, global engineering and design consultancy, as we explore their new Sydney office. Arup’s Sydney office won the ALIA Library Design Award in 2017 for its prototype space, and have since moved to a new building. At the heart of the new workplace, located within the atrium is Arup University, showing Arup’s core commitment to the skills and knowledge of employees. It is the first building in Australia to be awarded WELL Core and Shell Gold Precertification and central to the project is the wellbeing of its people, with a yoga and mindfulness suite, prayer rooms, a library and almost 900 plants to improve air quality. You’ll have the opportunity to hear about the project over breakfast, before taking a tour of the workplace. This is one visit not to miss. Come along to the networking area in the exhibition hall, level 4, from 3:30 to 5:30pm to meet up with Ann Ritchie and talk about health libraries. As the nature of work continues to change, how will we learn to thrive in new workplaces? It’s all about unleashing your curiosity to play with new technologies, build your digital confidence and solve problems with innovation and creativity. Join our international e-learning consultant Helen Beetham and a bunch of enthusiastic Librarians for the launch of CAUL’s Digital Dexterity initiatives. We will explore a new Digital Dexterity framework through inquiry-based learning. Get your hands on digital tools and toys as we collaboratively build a culture of experimentation. We will also give you the resources to create digitally dexterous experiences at your own libraries and be supported in the months to come by CAUL/CAVAL Digital Dexterity Community of Practice. Contact events@caval.edu.au if you have questions. Event sponsors: UTS Library, La Trobe University Library and CAVAL.